This is a single-storey Queen Anne cottage with a gable-on-hip roof and two pedimented gables, one on the right front over a cutaway angled bay extension and one on the left side. There is a more recent semi-circular window in the main gable. The front verandah has been rehabilitated to the owners’ design as no physical or photographic evidence of the original remained. The foundation and gables are shingled, the gables in an unusual pattern of octagon shingles. The house still has one-over-one windows and two brick chimneys. The house was shingled c.1908 over its original drop siding. The shingles were removed as part of the rehabilitation in 2004-05. Walter Cline was a carpenter from Ontario. In 1891, at 22, he was living in a boarding house with W. Cline, a mason who at 49 was likely his father. Jane and W.R. Jones, who lived in England, paid assessments from 1896 to c.1904. In 1904-05 they sold to Ellen Milne (617 Battery St) and in 1914 she sold to C.B. Strang, L. Hill and Marie Johnson. In 1926, Marie became sole owner, but as previously, the house was always a rental property. 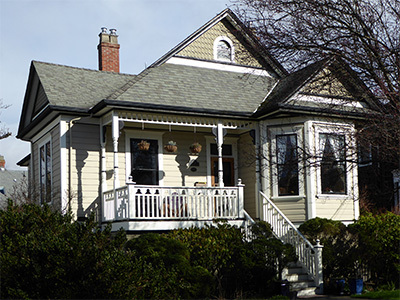 Victoria-born Alice Carr, daughter of Richard and Emily Carr and sister of artist and author Emily Carr (207 Government St & 642-46 Simcoe St, James Bay), rented the house and ran her kindergarten here c.1898-c.1906-07. However, according to city directories, she continued to live for the most part with her sisters in the family home, at that time 44 Carr St. In 1913 Alice built 218 St. Andrews St, James Bay, on part of the family garden, as her home and school. CVA has in its collection an ebony ruler which belonged to Miss Carr, donated by a woman who had been a student in both buildings. She said Miss Carr kept it to rap unruly students’ knuckles but she had never seen it used. Alice worked c.1914-22 as a nanny for English architect A.R. Hennell. She then reopened her kindergarten at 218 St Andrews until retiring c.1936 with failing eyesight. However, she knitted hundreds of clothing items for the Red Cross during WWII. In 1952, Alice commissioned Hennell to design a small stone bridge to be built in Beacon Hill Park in honour of her sister Emily. It was dedicated in a public ceremony in early 1953. Later that year, Alice died at 85 in her home on St Andrews St later that year. 1910-12: Alice and Frederick Garnham (15 Menzies St, 601 Toronto St, James Bay) came to Victoria in 1904. Fred, the son of William and Margaret Garnham (609 Toronto St, James Bay), was born in Montreal, fought in the 1885 Riel Rebellion, and worked as a conductor on the CPR. He worked for R.P. Rithet, then in munitions on James Island during WWI, but retired in 1917. A member of Victoria Conservative Association, he was president of Ward 4 for some time. He died in 1938 at 78. Alice, from New Brunswick, died in 1947 at 84. During WWI this was the home of John F. and Julia Johnson, both widowed when they married here in 1912. They had been living in Tacoma, and John was a carpenter, although he worked as an accountant during the war. Tenants: 1926-32: At the beginning of the Great Depression, the tenants were Emma (Boutin) and Wilfred T. Gagnon. Wilfred, born in Arichat, NS, was on the sea 35 years, many as chief officer of the cable ship Restorer. The Gagnons then lived next door in 624 Battery until at least 1939.